Located in Leon, the Virgen del Camino, is now a modern sanctuary built in 1961. But, if we start at the beginning, we would say that the chapel was first and then the people that comes alongside and the Hermitage. Being in the "Camino de Santiago", the name was easy Virgen del Camino or "Sales of the Road", as he knew well. A shepherd named Alvar Simón Fernández Gómez, a native and resident of Velilla de la Reina, tending his flock of sheep along the French pilgrim road, 5 km from the capital. While praying fervently saw a dazzling light, and the light in the middle of the voice of the Blessed Virgin came calling send word to the Bishop of Leon, Don Juan de Vera, and a shrine to his dedication to rise. The pastor, knowing that would not easily believe what happened, asked for a sign. Virgin took his hands his shepherd's sling and threw a small stone and pointing where he wanted his chapel was built. The stone began charging a staggering proportions, and the pastor fulfilled the mission entrusted to it. Lady's words were: "Go into the city, advises the bishop to come to this site and put in my place is decent image which my Son wanted to appear in this place, for the good of this land." To which the pastor replied: "Madam, how can I believe that you are sending me the Vos?". And he said the Virgin: "Give me that honda you have on hand" . And, taking her in his, Lady Sovereign took a small stone, placed in the sling and threw it saying: "Tell the bishop to find this great stone, which will be enough sign that I send, and in the same you will find the stone, it is my will and my son put the image " . Said the vision disappeared. Then, continues the tradition, tried, Bishop and many clergy and lay people who were to register themselves prodigy and became convinced of the truth, to raise a chapel in that place to place in it the blessed image. Tradition says the July 2, 1505 as the date of the occurrence. The 22-V-1517 was a papal bull issued by Pope Leo X, witnessing the apparition of the Blessed Virgin (to a certain pastor, and in dreams and otherwise). Alvar Simon abandoned pastoralism and spent the rest of his life with the Virgin and was buried in the chapel at the entrance of the chapel. So e n the early days of the occurrence, a small, poor hermitage it was built on the site now called the Shrine as a place designated by the Simon Shepherd, the presence of the Virgin, or rather, the site that stopped the stone thrown by the Mother of God. Soon the devotees felt the desirability of bringing the French way Shrine, busy route of pilgrims and pilgrims, and accessing these desires the Cabildo and Corregidor commissioned to build another wider and more luxurious the beds Saiz chapel, probably making Badajoz famous planes. The existence of the shrine dates back to 1513 Camino had stone doorway and two altarpieces. Subsequently, the building of a temple with three naves was undertaken and a short cruise, with vaults supported by thick square columns. It was officially opened in 1654. Los Reyes declared him under his patronage and sent Carlos II of Spain place the shield over the niche the statue of San Miguel. The second half of the seventeenth century was the most splendid shrine. In 1957 the foundation stone was laid for the current sanctuary, which opened on 5-IX-1961, and the spiritual care he was entrusted to the Dominicans. In 1905 the Brotherhood of Our Lady of the Way who revived the cult and devotion was founded somewhat lost. In 1914, it was declared Patroness of the Leon region, finally crowning the October 19, 1930. The image of the Virgin can place it between 1505-1512. Unknown author. 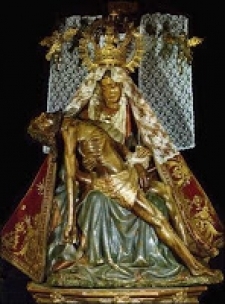 's a Dolorosa Virgin of Piedad or Distress Quinta, seated, with the Son died on the lap and the earth tilted face. Among the numerous votive offerings, chains are a captive in Algiers, Alonso de Ribera, birthplace Villamañán (Lion), locked in a chest and in the year of 1522, invoked the name of Our Lady of the Way and the act free from captivity and was miraculously transported to the sanctuary of the road, with the ark, the chain that surrounded and eat it sitting over the guarding. Christian: - "Allow God to rain tonight and tomorrow to shine my bread dry land." M: - "I deny the Christian, and denies"
The villagers, hearing the bells and not knowing what was happening, were terrified, thinking if there were a fire and tell the priest, who was equally surprised, since the church was locked, which he had in his possession, and could not get anyone. So all went to church, preceded by the priest. And what was his surprise to find inside the Moor and Christian sitting in the ark, that the Virgin had brought a miracle. The Moor converted to Christianity and the ark and the chain kept inside the old sanctuary, which were exposed to the devotion of the faithful , bearing the ark to be lined with zinc, because the devotees tore chips her to keep them as relics, as are you saying that cured toothache. Today can be seen in the new sanctuary in the room to the left of the image of the Virgin, known Votive Room. From the date of coronation of the Virgin, 1930, voices arise demanding a new sanctuary. The shortcomings and limitations of the existing evidence it seemed. More than one such attempt, but the high costs of a work of this magnitude, dilate waiting for years, until in 1957 is placed the first stone of the new shrine. Don Pablo Diez Fernandez of Leon Vegaquemada immigrant in Mexico and is the benefactor of all new construction, as well as a retreat house, a boarding school and convent for the PP community. Dominicans, who will be the new guiding the Sanctuary. Father Francisco Coello de Portugal, Dominican architect, is the author of the architectural project. It will combine harmoniously concrete, wood, stone and glass, according to the new style of religious architecture started in the fifties. The temple is a large rectangular volume, suggesting the form of a tomb that houses the large resurrected, claiming news from the rooftops bell tower of 53 meters high , released as a shout of glory in its verticality toward the heavens. As for the doors, the master has a height of three meters and its width is five. Bronze, as all the work of Subirachs. They are represented in it the joyful mysteries of the Rosary. Shepherd's Gate, located at the bottom of the right side, giving access from the outside, the chapel of the Virgin. In it the appearance of the Virgin represents Alvar Pastor Simon through the words to him, carved in high and low relief, and the figure of the shepherd surrounded by sheep. figure also see a sling around a stone taken Porma River in Leon, Dona Rosario, the wife of Don Pablo Díez. The door of San Froilan, dedicated, as the name suggests, the patron saint of the diocese of Leon, reflects some notes of his life and adventures in the land of León, with the silhouette of the Cathedral. And finally, the door of St. Paul, on the left side, parallel to the door of San Froilan, is dedicated to the Apostle of the Gentiles, coinciding with the birthday of the patron benefactor of the Shrine, Don Pablo. As regards the sculpture of the facade, is a representation of the glorious mysteries of the Rosary. The scene shows the descent of the Holy Spirit, which presupposes the Resurrection and Ascension of Christ into heaven. Elevated and crowned figure of Mary, the fourth and fifth round glorious mysteries. Thirteen bronze figures, six feet tall and weighing seven kilos each. Upon them, as suspended, are the tongues of fire. Each apostle has been characterized in a particular way by the sculptor, and their names are engraved on the entrance door to the sanctuary. On the inside of the temple stands above all the atmosphere of harmony and tranquility that are involved in the pilgrims and pilgrims to enter. Nada distracting. The sight and heart are uniquely attracted to the high altar and in the latter, the central figure of the Virgen del Camino with the Son in his hands. The church, including the Chapel of the Virgin, is fifty feet long, the width is sixteen meters and its height is thirteen, in the chancel, descending imperceptibly to ten meters from the entrance. The altarpiece belonged to the former church. It was done by carvers Pedro Leon and Antonio de Valladolid and completed in 1730. It is a monumental set of well-defined three bodies and three blocks by three pairs of twin columns on either side of the image of the Virgin. Their festivities are celebrated on September 15 and the festival of San Froilan is October 5, this pilgrimage attracts large number of people coming from across the province and of the Principality of Asturias. The festival is celebrated to the sound of music and regional and with the presence of cars decked dances and banners, can not leave without trying the typical sausages without buying traditional market fed hazelnuts on which is mounted for the occasion without pulling the nose to San Froilan.